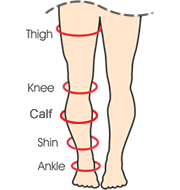 Contraindications: Anti-Embolism Stockings are not recommended for patients with: severe arteriosclerosis or other severe ischemic vascular diseases, including absence of pedal pulses; local skin disorders such as dermatitis, open ulcerations, infections, recent vein ligation, skin graft, or gangrene in which stockings would interfere; massive peripheral edema associated with pulmonary edema; severe congestive heart failure or severely deformed extremity. Measure area in red to get circumference. 172 points will be rewarded to you when you buy this item.